Click the pic to see the full feature.When self proclaimed writer, tall people advocate and out-the-box thinker Arianne Cohen asked me if I wanted to participate in Bloomberg Buisnessweek's What I Wear to Work feature, I muffled my screams of excitement and said yes in the calmest way I possibly could. 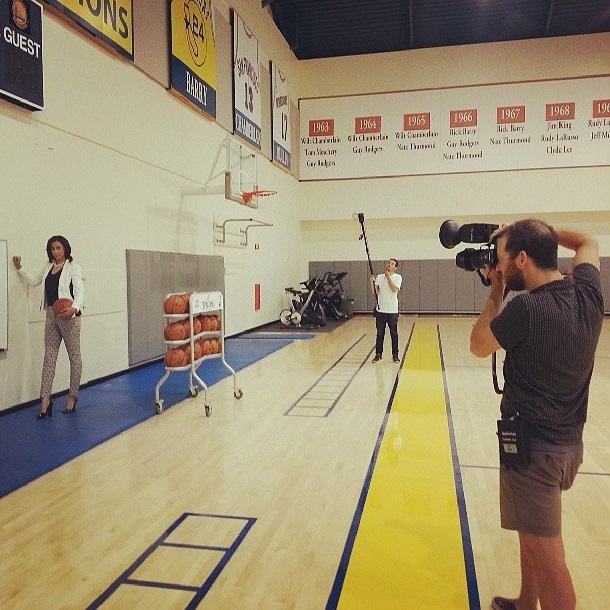 For those of you who don't know, when I am not blogging about tall, fabulous fashion I am the Game Operations Manager for the Golden State Warriors. In a nutshell, I manage the entertainment and in-game fan experience for all Warriors home and Playoff games (#WarriorsGround #DubNation). All I can think about when I see this photo is a quote from one of the greatest movies of all time...Clueless: 'My plastic surgeon doesn't want me doing any activities where balls fly at my nose.' Please note. I have not had any work done. It's just a quote. As If!!! Fierce. Werk in those high heels on that exercise mat tall lady!It was such a fun shoot and one of the most amazing parts about it (besides the fact that it was happening) is that one of my best friends Holley (my Silly SIL) was in the building making sure I was looking my fiercest. I'm in a national magazine yall! A huge thank you to God (always and forever), Arianne Cohen, Bloomberg BuisnessWeek, Jake Stangel, Alis Atwell (photo editor and coordinator of the shoot) and last but certainly not least make-up artist extraordinare Nikki Notarte for beating this face and whipping this hair for the piece. This tall girl is so incredibly thankful! CHARLIE V-NECK BLOUSE from HEIGHT GODDESS. $79. Shown in black. Also comes in tote basket and Fuschsia. Shown in a size L. Comes in sizes small to X-Large. MONOCROME COLOR BLOCK JACKET from Long Tall Sally. ON SALE for $69. Shown in a size 10. Sizes 6 and 12-18. GEO JACQUARD TROUSERS from NEXT. SOLD OUT:( Click for other print pant options. Click to view the entire NEXT tall line. TROPICAL GEM BIB from Bauble Bar. SOLD OUT:( Click to get on the Waitlist. Click to view the entire Bauble Bar necklace line. TART DECO from Essie. $8. J. RENEE RATTLE HEEL from Barefoot Tess. $112. Shown in a size 12. Only 1 size 11 left! Click to view all heels up to size 15 at Barefoot Tess.